SacredEarth Botanicals' unscented massage cream is thick, rich and concentrated so a small amount will offer several minutes of workability. Our cream was formulated to provide great grip for controlled strokes and deep tissue work, yet offer the glide of oil making it an excellent choice for a full body massage as well. Rich in essential fatty acids and organic botanical extracts for a calming, therapeutic experience for the client. Unscented, hypo-allergenic and vegan, our massage cream will please even the most discriminating clients. Ethyl Hexyl Glycerin - vegetable based preservative. I unfortunately suffer for dermatiti. and at the suggestion of the seller I tried this brand and I am happy to say that my hands and skin are happy and my clients are as well. This has great glide, no scent and ingredients that can be irritating. I highly recommend to any of yo out there that are having issue. I've re-ordered this many times. I've been practicing since the 80s and in that time I've used Cayce oil formulas, fractionated or solid coconut oil, pecan oil, almond oil, and creams/lotions Soothing Touch and Biotone. 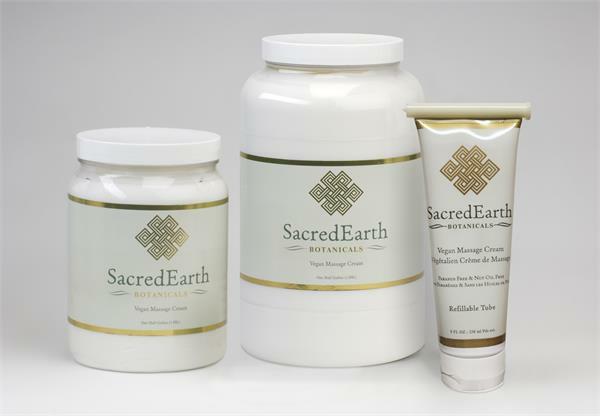 I first tried Sacred Earth when Soothing Touch changed their pump lotion formula and my clients and I immediately broke out in rashes, sad to say. I wanted something with little or no scent, a medium drag and staying power. This was perfect. I don't slide off the client but the glide stays longer than the Biotone formulas (I use a fairly firm stroke and do a good deal of deep tissue and crossfiber work). No one gets a skin irritation from it and people appreciate the absence of aroma. I've tried other creams as they reached the market and never found any I preferred.